In a hangar off the flightline at Incirlik Air Base in southeastern Turkey, Army Gen. Joseph L. Votel, commander of U.S. Central Command, greets representatives from a Marine Corps EA-6 Prowler Squadron, a KC-135 tanker crew, and several aircraft maintainers, May 23, 2016. 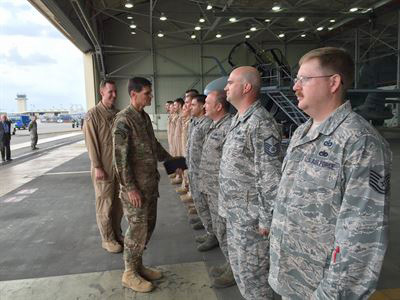 Votel was accompanied by 447th Air Expeditionary Group Commander Air Force Col. Sean McCarthy. In a hangar off the flightline at Incirlik Air Base in southeastern Turkey, Army Gen. Joseph L. Votel — accompanied by 447th Air Expeditionary Group Commander Air Force Col. Sean McCarthy — greeted representatives from a Marine Corps EA-6 Prowler Squadron, a KC-135 tanker crew and several aircraft maintainers. The U.S. Central Command commander’s visit to Incirlik May 23 was the final stop in a trip this week that took him to five countries in Centcom’s area of responsibility. Speaking to reporters traveling with Votel, McCarthy said he commands 550 military personnel involved with his 12 A-10 Thunderbolt II attack aircraft and 12 KC-135 Stratotankers — 350 to 375 of them associated with A-10 maintenance or operations. The colonel said right now most A-10 missions are over Syria and include air support for the Syrian Democratic Forces in the northeastern part of the country. The tempo of operations over Syria is 24/7, McCarthy said. “And that’s not just the A-10s. That’s the coalition,” he added. 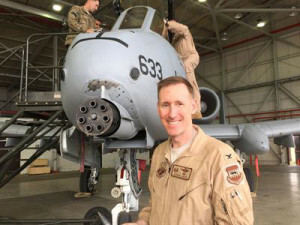 The A-10s, commonly known as “Warthogs,” arrived Oct. 18, 2015, just after the Turkish government opened Incirlik up to strike assets, McCarthy said. The A-10 crews at that time were from Moody Air Force Base in Valdosta, Ga., and they redeployed in late April. Now crews from the Boise, Idaho, Air National Guard fly and maintain the A-10s. The A-10 missions are usually autonomous, McCarthy said. “Integration isn’t required at the dynamic level — so a troops-in-contact [report] pops up or a target pops up at short notice, and we respond. It generally doesn’t involve an integrated effort with the coalition. It’s just usually a two-ship of A-10s that show up overhead and we conduct our mission,” he added. “Where we do integrate as a coalition is on deliberate targeting, deliberate strikes,” McCarthy explained. To coordinate a deliberate strike, the Combined Air Operations Center works with a regional Combined Joint Task Force target engagement authority to vet a target, determining which weapons are needed to strike the target, which assets have the right capabilities, and which assets are available, he added. “Deliberate targeting is only about 10 percent of our missions versus dynamic. 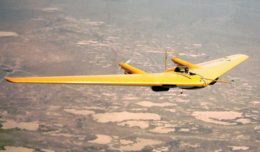 You never know when the dynamic need is going to arise, that’s why you need aircraft airborne pretty much all the time in the strategic locations,” McCarthy said. Air Force Col. Sean McCarthy, 447th Air Expeditionary Group Commander stands in front of one of the 12 A-10 Thunderbolt II attack aircraft under his command at Incirlik Air Base in southeastern Turkey, May 23, 2016. Earlier in the week in Baghdad, Marine Corps Brig. Gen. Bill Mullen, the target engagement authority for Central Iraq, discussed the strike-vetting process. “The No. 1 thing when it comes to strikes is making sure we do as little damage as possible, especially killing civilians. We try very hard to keep that from happening,” he said. For McCarthy, the decision to employ the A-10 itself speaks to the collateral damage and civilian casualty issues. “Gone are the days when they had to download bombs, upload torpedoes, and where they could only carry one thing. On the A-10 we carry just about everything that we’re slated to do [on a mission] on one aircraft,” he said. The colonel said the gun — a hydraulically driven seven-barrel Gatling-type auto-cannon — is the only thing on the A-10 that’s not guided by a Global Positioning System signal or a laser beam. “But you don’t need it to, because it’s so deadly accurate,” he added. Pilots tend to use the gun when collateral damage is a concern, he said. Pilots might use a 2,000-pound bomb if they wanted to go after a large building, for example, but to avoid collateral damage they might instead use a smaller bomb or delay the fuzing, allowing the bomb to penetrate the target a little before exploding to contain the blast, the colonel said. If the mission involves a checkpoint being run by the Islamic State of Iraq and the Levant and the A-10s “want to go after the guys running the checkpoint, but we don’t want to target the vehicles they’re inspecting because there’s no way to know whether they’re civilian noncombatants or not, we don’t take the chance [of using a bomb],” McCarthy said. The mission at Incirlik, McCarthy added, is like an Olympics for A-10 pilots. “This is where we get to use our craft,” he said.